I took a pre-conference workshop at ANWG in Victoria BC at the end of June. Bryan Whitehead came from his home in a silk farming town outside of Tokyo to teach us how to make bamboo reeds for weaving. He brought all the materials, and had spent more than a year preparing them for us. Workshop materials: whole Aodake, higo strips, blocks of hinoki for supporting reeds-in-progress, and packets of prepared reeds. The Aodake (type of bamboo) is split and peeled progressively from the whole chunk, about 5-6 cm diameter, to the narrow higo strips used for basketry. These strips are then cut to size for reeds. Each individual reed is about 9 cm long, 4 mm wide and 0.4 mm thick, with beveled edges (the length is variable, the width and thickness uniform because that's important for consistency in the finished tool.) All of Bryan's students received packets of 330 of these small pieces to make our reeds. The amount of effort that went into preparing them is astounding: before the bamboo is even cut, it is dried for months, cured over a fire to release oils, and dried some more. During the first day of our workshop, Bryan demonstrated the methods of splitting and peeling bamboo, and beveling and planing the higo. It looked smooth and easy as he worked, but when we tried we found that doing it right is tricky and difficult. Splitting the bamboo in half with a machete, after making initial cuts in the top. Peeling off the outer 1/3 of a 1cm strip. The inner bit will be discarded. Throughout the workshop Bryan gave us the historical, cultural, and aesthetic context of bamboo, weaving, and cloth in Japan. Since I'd lived in Japan years ago, it was nice to re-immerse in this world, and memories of the place and the language came to the surface of my mind. The block of wood we used as a stand for reed building is made of hinoki, a type of cedar used in Japanese baths. The smell evoked onsen, hot springs, one of my favorite aspects of living in Japan, and I kept happily inhaling the distinctive scent as I worked. I'm grateful that we got to keep the wood. Bryan didn't just bring us a technique - he brought as much of a cultural experience as he could to the physics lab on the UVic campus. When people attend workshops in his home, they're surrounded by the indigo and tea fields, the bamboo forest, and centuries-old silk weaving houses. It was challenging for him to translate both the terminology and the experiences into English, but he succeeded - probably because he's spent the last 30 years bridging cultures. Antique reeds from Japan that Bryan showed us, pointing out the details we would learn as we made ours. Tools used for cutting the bamboo. Our class was unusual for a weaving conference, and more than one weaver asked me why I was making a reed. 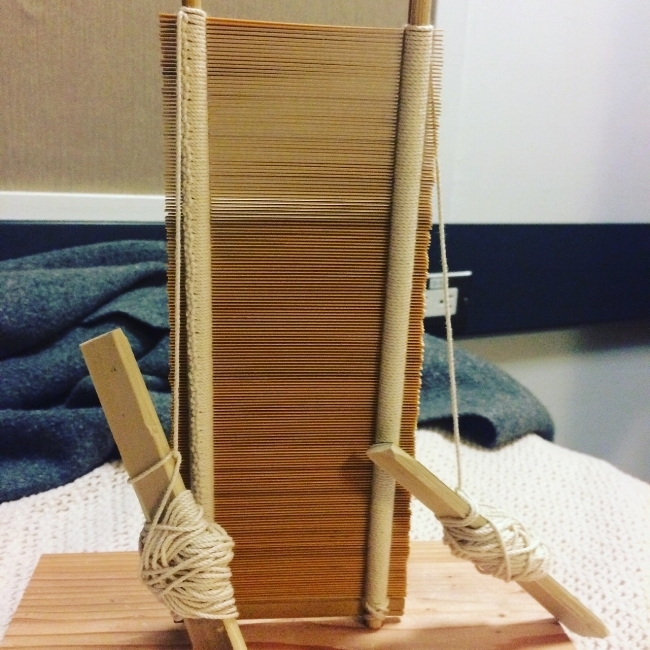 As a backstrap weaver, I've been seeking this kind of tool-making skill and knowledge for a while, but to most weavers using floor looms, it's not necessary. For this reason, our class was a group of people with interests slightly outside the norm for North American weavers. We were remarkably harmonious, and many in the group have a strong urge to travel to Japan for further study with Bryan sensei. More to come on what we actually did, and where it has led me. The beginning of a reed, after I got the knotting right.